I've had so many Paul Frank iPhone cases I've lost count. Blue, Red, Black, Green, you name it. 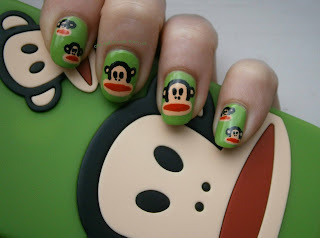 So I thought it was about time I did a nail design based around one of them, my latest one and my favourite colour: GREEN! I intended to do these quite early in the evening, but my boyfriend called me for over an hour and then my friend called me with troubles, so these were done around 1am, and I am so tired as a result, but I love them! Mainly because of how much I love Paul Frank :D Hope you like them too! 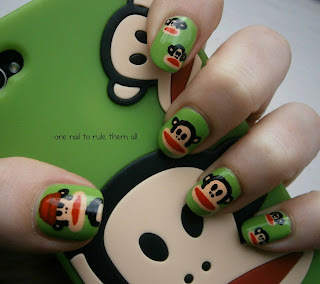 Omg i absolutely love paul frank that is now on the top of my list to do!! !